Sadness at Hardy's loss quickly turned to action to catch whoever did this despicable act. IDA quickly put out a reward offer of $500 hoping for the arrest and conviction of the monster responsible. Very soon thereafter, a witness to the crime heard about IDA's reward offer, stepped forward with information, and Winona resident Michael Forrest was arrested and officially charged. 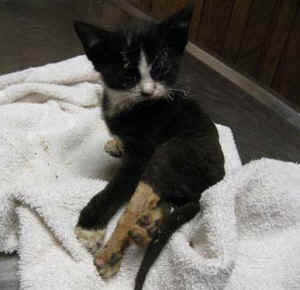 In October of last year, Doll Stanley, director of IDA's Hope Animal Sanctuary (HAS) in Mississippi, received a disturbing call of a beaten, burned, and partially paralyzed kitten. The black and white (tuxedo) kitten, Doll named Hardy, was approximately twelve weeks old. She was found in Winona, Mississippi, about twenty miles south of the Sanctuary. She was bright-eyed, alert, and friendly, despite the horror she clearly been subjected to. Her whiskers and hair were singed, all four feet were badly burned, she had other injuries consistent with having been beaten, and had lost the use of her back legs. Her injuries so severe that HAS's veterinarian determined the most humane option was euthanasia. On February 18, Mr. Forrest entered a Winona courtroom in shackles for his trial. He was convicted and handed the maximum sentence allowed under Mississippi law, a $1,500 fine, 30 days in jail, and court costs. While we are deeply saddened by the needless suffering and loss of Hardy's life, we are thrilled that the perpetrator was charged and convicted. We thank presiding Judge Devo Lancaster and Winona law enforcement for taking this case of wanton animal cruelty seriously.